E-Learning Unit funded a project led by Dr. Thomas Asbridge (School of History) to explore and implement a solution to organise a complex historical topic, the crusades, and allow students to contribute to the project with their own research. The solution was to create an interactive timeline that shows parallel events during the crusades from various perspectives. 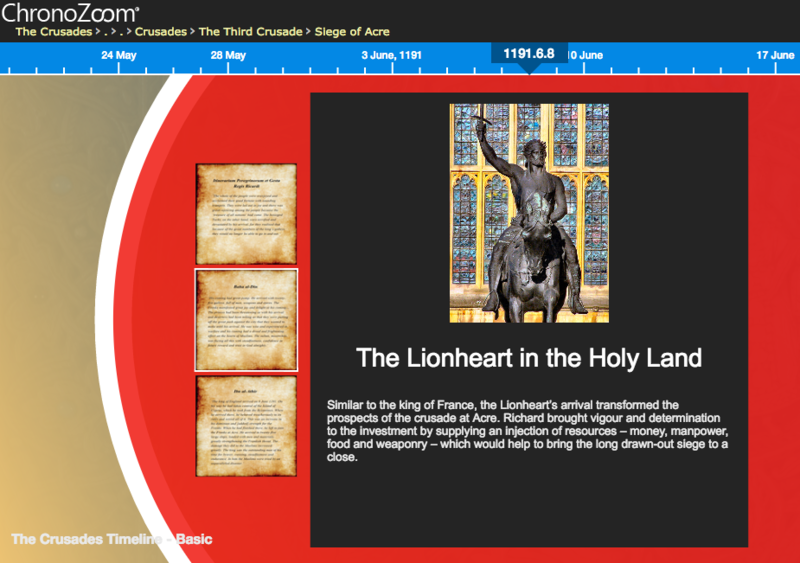 The timeline application, Microsoft ChronoZoom, not only allows QMUL students to contribute to the project, but will also be used as a learning resource for ‘Teaching the Crusades Network’, which bring academics and school teachers together to discuss the topic. This project was funded by the E-Learning Production Scheme. Complex historical topics can be difficult for students to visualise, sometime losing the larger picture with so many connected events spanning hundreds of years. Project lead, Dr. Thomas Asbridge, is a medieval historian specialising in the study of the crusades and the broader history of relations between Islam and the West. He wanted to find a new way to publish this research online, making it easier to navigate, and for students to contribute to the ongoing development of the timeline. Dr. Asbridge submitted his initial plans for this project through the E-Learning Production Scheme. This provided the initial structure and funding for the project, with technical consultation from the E-Learning Unit, and project support from two students. After assessing several online timeline products, it was decided that ChronoZoom would be the best fit for the content. The two students hired for the project worked with the E-Learning Unit and the project lead to research the artifacts that would create the initial structure for the timeline. The students divided the work, developing content for the timeline, and building it into the online system for publishing. By the end of the project, two timelines were created (a simple and complex timeline), which can now be further developed by undergraduates as part of their course work, and as a tool for public engagement with the School of History. 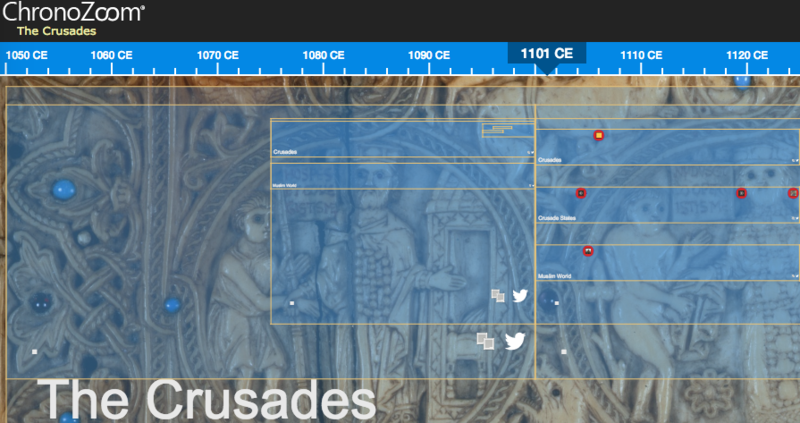 The goal is continue building this timeline and hosting it as an open public resource for anyone interested in the history of the crusades. Developing this timeline provided a unique format for publishing academic content, which helps reader with its interactive and visual elements. Because you can allow multiple editors to work in the system simultaneously, it can also be used as an online tool for collaborative research and content development. ChronoZoom allowed the team to find a creative format for communicating a detailed and complex topic. The product will now be used as an open resource for public engagement, and to help raise the profile of the excellent work happening in the School of History. If you are interested in creating timelines, I would recommend considering a few applications before proceeding. ChronoZoom was the ideal application for this project, but for smaller or less complex timelines, another tool may better meet your requirements. ChronoZoom was slightly buggy, with some unpredictable behaviour and minor data loss. Because of this, we always maintained a backup of our images and articles before placing them into the timeline. There were also some issues with image hosting. We initially stored all of the files in OneDrive, and then embedded them into the timeline. This created issues with images displaying correctly and loading into the timeline interface. The solution was to post the images on an existing WordPress site, which may not be available to you. ChronoZoom worked will for this project, but had a steeper learning curve than some of the alternatives.